Are you becoming a new tenant? If you are in the process of becoming a new tenant with us, there are a few things that you should know. If you would like to apply as a tenant to one of our properties, please complete the application form below. If you would like to log a maintenance request, you can do so by completing the form below. Taking on a new tenancy can seem a little daunting, especially if this is the first time you have been involved in this process. But don’t worry, we are here to help and will keep this as simple and painless as possible. Before signing a new tenancy agreement with us, we would like to discuss some of your key responsibilities as our newest tenant and some other important information that you will need to know to keep things running smoothly. Below you will find some resources which should give you an understanding of what to expect over the next couple of weeks. 1) What happens after you’ve been accepted? First up, we will need you to pay one week in advance in order to secure your new home. Until this happens, we will be forced to continue to advertise the property as available. You can pop into the office any time during business hours and we can take an EFTPOS payment from you. If you prefer, we can also take a cash payment. Pop into the office anytime during business hours. Your property manager will be in touch if they haven’t already to book in a time for you to come into the office. The purpose of this meeting is to run through your tenancy agreement and bond lodgement form, and talk you through your obligations as our newest tenant. They will of course be there to answer any questions you have along the way. We have a standard tenancy agreement which you will need to sign. 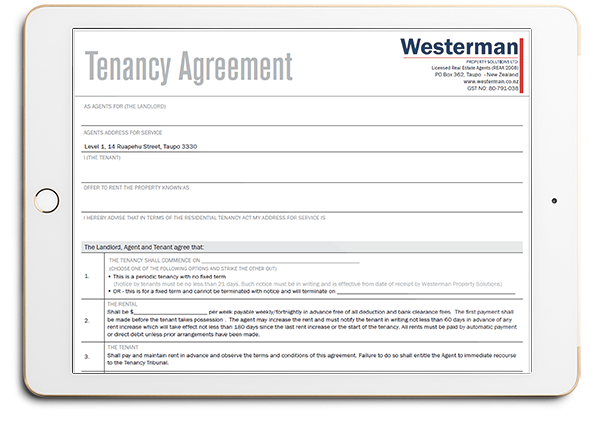 This agreement is designed to protect your, the landlord and Westermans as the agent looking after the property. This agreement is in accordance with the Residential Tenancies Act 1986. When you meet with your property manager, they will walk you through this agreement and carefully explain all of the terms and what they mean to you as a tenant before you sign the agreement. You can download a copy of the standard agreement below. Have a read through and bring along any questions you have to your property manager. 3) What else is required to be paid prior to moving in? The letting fee is calculated as one weeks rent + GST. For example, if your property is $300 per week, then the letting fee would be $300 + 15%($45) = $345. Your bond is calculated as four weeks rent and will be lodged with the New Zealand Tenancy Services Bond Centre. This payment is made in conjunction with a lodgement form that your property manager will talk you through when you are signing your tenancy agreement. You can pay your bond the same way as you will have paid your rent in advance. The bond is refunded at the end of your tenancy provided the property is left in the same condition as when you moved in and no rent is owing. All rent is required to be paid through an automatic payment from your bank account. We will discuss with you the best day to have this deducted from your account. 4) What is an ‘Entry Inspection Report’ and why is it so important? Along with your tenant pack, all tenants will receive a chattel list or condition report of the property, together with a comprehensive selection of photos that we will take prior to your tenancy starting. Along with a large amount of photos we will take of the property prior to your tenancy, this list gives a written snapshot of the condition of the property prior to you taking over. This is important to protect you so that at the end of your tenancy, you are not blamed for any pre-existing damages or required repairs. Over that first two weeks as you settle in, take the time to check the list off against what you find in the property. Make notes of any additional damage or issues found so that these can be reported to your property manager. Those two weeks also give you the opportunity to note any repairs and maintenance that you feel are required. Your property manager will make an appointment to pop round to complete the first inspection with you and to go over the condition report and discuss any issues you may have, but more importantly to ensure that you have settled in comfortably to your new home. Remember that your condition report needs to be signed by you as the tenant so that you accept the condition report including any required amendments agreed with your property manager. If you haven’t returned the signed condition report at or before your first inspection, as per your tenancy agreement, it is deemed that you have accepted the property in the condition it is in as per the chattel list. 5) How do you log a maintenance request? General maintenance requests are managed online from our website. Something has happened on your property that will significantly impact on your living conditions at the property and needs to be addressed immediately. For any urgent maintenance, please call the office directly and we will be able to help you. 7) How do routine inspections work? At least three times per year, your property manager will schedule a routine inspection of the property. You will be given at least 48 hours notice of the inspection and you will be expected to have the property in a clean and tidy state prior to the inspection. The purpose of the inspection is to ensure that any maintenance issues are dealt with, so if you have anything you’d like to recommend to your property manager to repair or investigate, have those issues ready prior to the inspection. The property manager will present the property owner with a detailed report of the condition of the property including photographs, thus giving our property owners peace of mind that the property is being looked after. Managing rent arrears is an extremely important part of our responsibilities to our landlords. Ensuring that every one of our tenants pays on time, every time, plays a big part in why those owners put their trust in us. We have a very strict policy when it comes to managing rent payments and this is the same across the board for every one of our property managers. As a tenant, paying your rent on time every week, fortnight or month depending on how often you pay, should be your very first priority. Much the same as your Landlord has to ensure that their mortgage repayment is their first priority each week. The first day after you miss a rent payment, you will be sent a text message reminding you of the missed payment and what’s required to be paid. If no response is received or no payment made, on the 5th day after rent is due, you’ll be issued with a 14 day notice as a breach of the Residential Tenancies Act for those arrears. On day 7 after the missed payment, you’ll be sent another text reminder about the arrears and the fact that a 14 day notice has been issued. By the 12th day with no payment, you’ll be lodged with the tenancy tribunal for those arrears which could result in the termination of your tenancy at a hearing of the Tenancy Tribunal. We like to work closely with all our tenants and understand that issues do arise, but being proactive and informing your property manager of any problems with rent payments will make the whole process much smoother.